Clockwise from bottom left: David Walrond, Gordon Seabright, Simon Caklais, Frances Brennan, Steve Jermy. 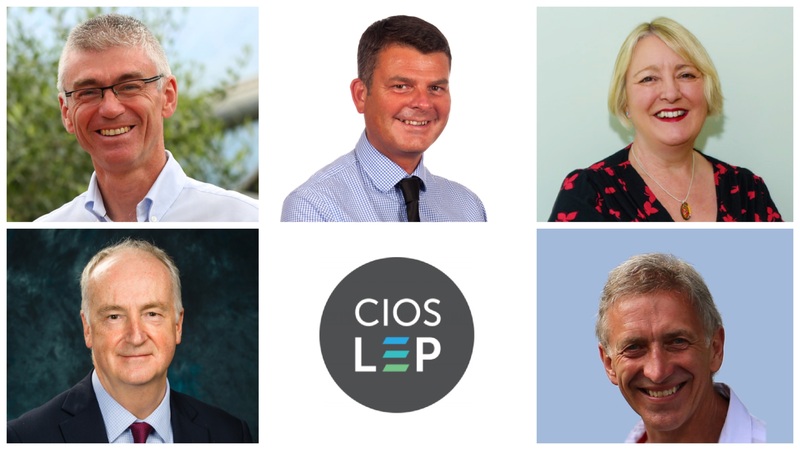 The Cornwall and Isles of Scilly Local Enterprise partnership has announced the appointment of five new non-executive directors to its board following a recruitment process started in December last year. The five appointees will formally take up their unpaid roles in May and will replace a number of current LEP directors who are due to step down during the course of 2018. Frances Brennan is strategic stakeholder Lead for Pluss Ltd, an award-winning social enterprise that supports thousands of people with disabilities and other disadvantages to move towards and into employment each year. She has 35 years’ experience in private, public and social enterprise sectors, successfully delivering a wide range of Government programmes through the South West, recently leading the introduction of a £71 million Work & Health programme within the Southern area. Simon Caklais is MD of Gilbert & Goode Construction, one of Cornwall’s largest construction companies in. Caklais sits on the LEP’s Construction Strategy Steering Group, and chairs the Cornwall Constructing Excellence Club. He has over 30 years’ experience in construction and housing, pioneering a number of progressive industry initiatives. Steve Jermy is a former naval officer and chartered marine technologist, with over 35 years’ offshore experience. He is an offshore renewables consultant, and research and development lead for Falmouth-based James Fisher Marine Services Ltd, and MD of Tide Mills Ltd, an offshore renewables consultancy. Since 2016, he has chaired the Marine Offshore Renewables Group, the trade body representing the Cornwall and south west offshore renewables sector. Gordon Seabright is chief executive of the Eden Project, leading over 550 staff and 170 volunteers at the famous educational and environmental charity and visitor attraction. Since his arrival in 2014 he has presided over a significant increase in visitor numbers, turnover and earnings, and turned Eden into a campus for degree level students. He has held previous roles with national cycling charity CTC, the Royal Horticultural Society and English Heritage. David Walrond has been principal of Truro and Penwith College since 2010, having joined as director of quality and planning in 2003. Under his leadership the college has been awarded the National Beacon Award for Leadership and Governance and was the first further education college to be ranked ‘Outstanding’ under Ofsted’s new inspection framework. Last year a new campus opened at Callywith in Bodmin, having attracted £23 million of capital funding from Government. Duddridge also paid tribute to those LEP board members stepping down during the course of 2018, having reached the end of their terms. Chris Loughlin stepped down in January; Gavin Poole will finish in May, and Andrew Williams and Roland Tiplady will both step down after November’s board meeting.